I love it. It is exactly like the set that was online for West Elm last season. I have it in an uncovered area so I didn’t want cushions. The seats are comfortable and the whole set washes of great with a hose. Several rains and very solid. Delivery was great. Chairs came put together with plenty of wrapping. Only had to put the table together. 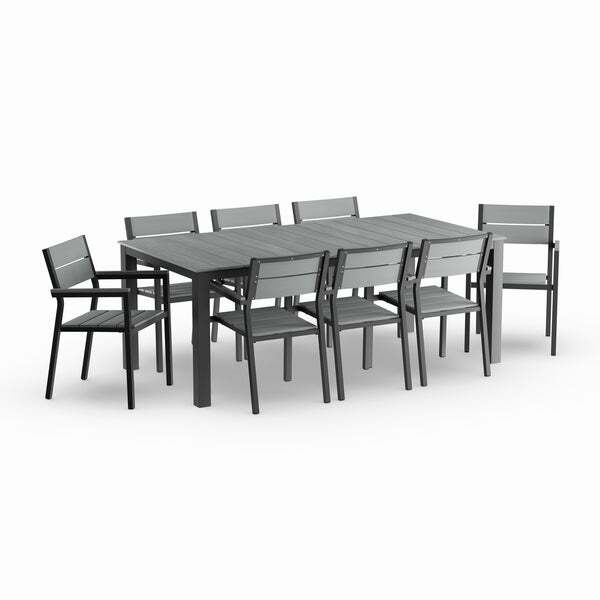 Distinguished design and modern sensibility get a showcase in this sturdy and effortless dining set. 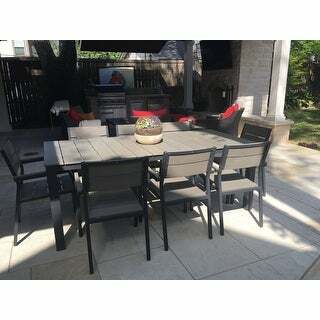 Enjoy afternoon meals on the patio with your favorite friends on this refreshing set made of solid plywood for a rich organic feel that pairs nicely with the aluminum frame. Very attractive table and a nice size! My only concern was that the shippers did not deliver the legs (they were in a separate box) and it took several weeks to ship out. I'm working with Overstock now to get the legs delivered. 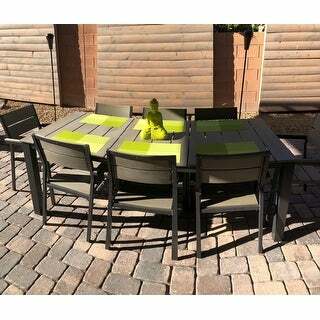 This polywood dining table and chairs looks great. The table looks sleek and modern. We had lunch and the chairs were very comfortable. I like how modern and clean it looked next to our modern blue pool and grey wicker conversation set. This dining set definitely looks nice. It's a really good price. The polywood is so durable for the scorching Houston heat. I would have given it five stars but my dining table and a few of the chairs arrived with oil looking stains and one of my chairs arrived damaged as the box was damaged in transit. The shipping strap used to hold the boxes together cut into the box and damaged one of the chairs. And after carefully cleaning twice, the stains were still there. 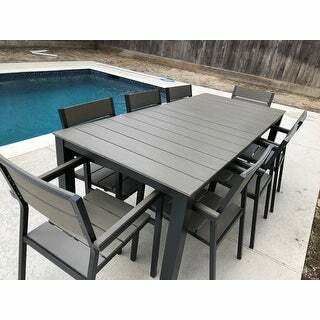 I read every review of many patio dining sets. This one ranked the highest for the price. I was on the email notification list for several weeks before it was available again. I ordered my set immediately and once again, this set sold out quickly. I have the white and light gray which is the most popular set compared to the black/brown set. When my set arrived it was packaged very well. The only assembly required was to screw on the table legs. I have the real Pollywood set at our second home which is 3 times the cost, but this Maine set is an excellent substitute. It is good quality, comfortable seating, and looks fantastic. I got this set in the grey/brown color. Modern looking and sturdy. I have mine under a 9x12 outdoor rug and it looks fabulous. It does show some stains after eating on it so I wipe it down with a wet paper towel after each use. 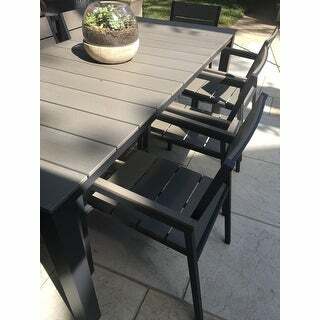 We love this table and chair set! Great set. Easy to assemble and looks chic. 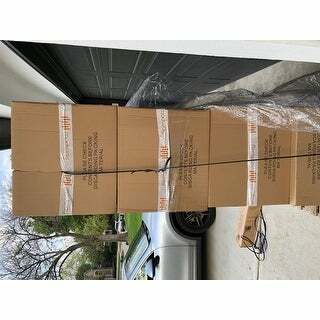 Product arrived quickly. The color looks great. The chairs are comfortable without being bulky on the Deck. Cannot wait for warm weather to try it out. es como la foto o mas increible, luce moderno y facil de limpiar. Muy feliz con mi compra. Vino en un embaleje perfecto. The grey tabletop color has weathered well. We have it on a deck which is exposed to full sun most of the day. Chairs do not get too hot and the table color has not faded in the sun. Stylist sturdy well made table and chairs . "Do you still have it in white & Gray? or is it gray and brown only?" "Has anyone purchased the brown/grey set? We are doing a black handrail around the deck and don't want the brown of this set to clash." "Is there an umbrella hole"
The table does not have an umbrella hole. "Can all the chairs fit under the table at the same time?" The depth of the table, 35.5, and the depth of the chair, 22, would imply not all the way. "Can you please clarify which color is which? Is the brown/gray the dark frame with light wood or the light frame with darker wood? It is hard to tell from the pictures. Thanks!" The item is no longer available at this time. "If this set is in direct sun light will it be hot to the touch?" The metal may warm up but the polywood shouldn't.